Passez de merveilleuses vacances à Mammoth Lakes en séjournant à Chamonix. Chamonix # 096 dispose de 2 chambres à coucher, de 3 salles de bain et d'un loft pouvant accueillir jusqu'à 6 personnes. Ce complexe de condominiums est situé dans un excellent quartier pour accéder aux activités saisonnières toute l'année. Vous allez adorer la distance courte à la montagne et au centre-ville. Vous serez à distance de marche du Canyon Lodge et de la télécabine du village. Restaurants, boutiques, sentiers de randonnée et pistes cyclables et terrains de golf sont tous rapidement accessibles en voiture. Cette location de vacances est parfaite pour une petite famille ou un groupe d'amis. Déposez votre équipement d'hiver dans la salle de la boue fermée et vérifiez le reste de la maison. En bas se compose des chambres. La chambre principale est meublée avec un lit king-size confortable et une salle de bain privée attenante. La deuxième chambre a un lit Queen et une salle de bain complète attenante. Le salon dispose d'une cheminée idéale pour se réchauffer après une journée passée à la montagne. Des sièges moelleux sont rassemblés autour de la télévision. Un accès Internet haut débit est également fourni pour votre plus grand plaisir. Une cuisine bien équipée permet au chef de préparer de délicieux repas. Vous pourrez entretenir la compagnie du chef en prenant place au bar à petit-déjeuner intégré. Placez les repas sur la table à manger d'apparat pour 4 personnes et dégustez un repas fait maison avec la famille. En haut dans le grenier, vous trouverez des options de couchage supplémentaires. Le loft a 2 lits QD. Il y a aussi une salle de bain complète à l'étage. Chamonix propose une variété de commodités communes que vous pourrez vérifier. Il y a 2 places de parking non affectées, un club house avec table de billard, foyer, sauna et bain à remous. La piscine et les barbecues sont ouverts en été. Great location. Condo has most of what you need. Easy walk to Canyon Lodge. The only thing good about this condo is the location. The pictures on the advertisement are not accurate, the place is dirty and needs a lot of work. The room configuration has changed. There are no longer 7 beds, now there is only 4. There is no access to the jacuzzi. Management company pretty much sucked as well. Skip this one, not worth it for the price. 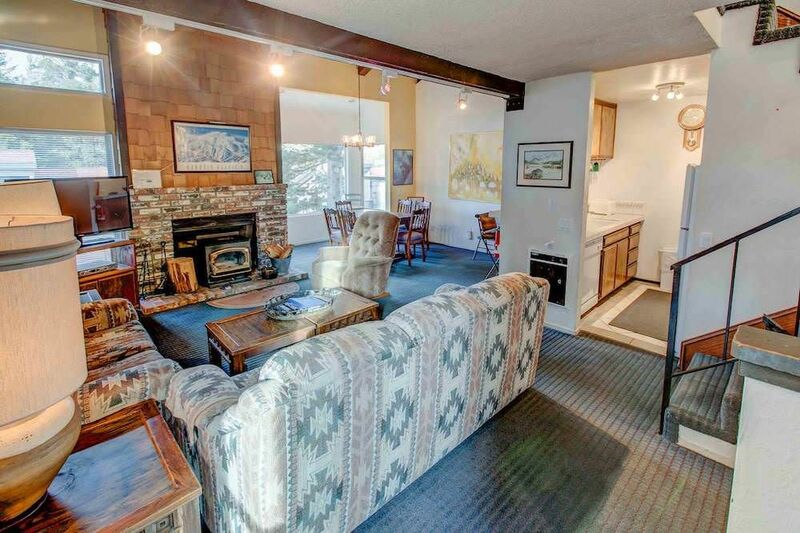 Cozy cabin right next to Canyon lodge, perfect location and even has a hot tub on the property. Pretty clean but needs some updates, reason for the 4 stars and not 5. Hello Flavia, Thank you for taking the time to review your stay. We would love to have you back, please let us know if we can help you with a future booking. This property SHOULD NOT BE FOR RENT!!! It is less than substandard if you can imagine that! This property is completely misrepresented in the pictures and the description. There are only two regular beds in the loft, no bunk beds, and only one bed in each bedroom. The furniture is so old, you feel like you can not touch anything as it will literally fall apart. The railing on the stairs is so loose that if you have small kids they most definitely cannot be left to roam around at all, as they can fly through the railing at any time. The opening from the loft to the downstairs is completely unsafe, as it is so low on the wall and has a very shaky and unsafe shutter, so again no kids can be left in the loft as they can very easily fall over downstairs. The entire place is falling apart, and none of the description or the pictures match the actual place. I wish I could upload the pictures I took during our stay for people to have a real expectation of this place! I read the previous reviews and felt like there is no way this place could be this bad, but it’s worse than the worst review you can read. We called the management company the first day once we checked in to let them know that this is not the place we rented based on what the pictures show and what this place is, the number of beds, which were really important to us as we had 10 people and 3 families so private beds were important, and they said the owner had changed the furniture but it just didn’t get updated. We told them we chose this place based on the information provided and the configuration doesn’t work for us, not to mention that the place should not be allowed to be rented in the condition it was in, and they told us the manager was not there at the time but they would call us back the next day. We never got a call back. We called again the next day as the front door was not locking and it looked like someone broke through it, and they sent someone to fix it the next day, who said they knew it was broken as when the cleaning crew went to clean the unit before we checked in the key did not work and they had to break the door/lock. WHAT????? You knew the front door had no lock, and let us move in like that!?!?!? The heaters were not working in two rooms either, they did get fixed the following day but again, a frozen night with no locks on the front door and small children in the cabin is NOT ok!!!!! I have never written a review before, as I am not one to complain, but this exceeds any imaginable bad experience and unsafe rental place! DO NOT RENT THIS PLACE!!!!! Location is great. That is all the nice things I can say. Cons: the railing I the loft is large enough for an adult to slip through-- solved it by placing broken plexiglass around it(i got sliced open). The dresser in the bedroom is falling apart with nails sticking out. No the kitchen isn't stalked with proper supplies: no knifes, all 30 plates are chipped or cracked, good luck opening the oven safely. The smoke detectors are low on batteries. No fans anywhere; the summer is HOT and no air circulation. The bedding: ripped,snagged, and just falling apart, the pillows are flatter then a pancake and bought in 1980. The nice little wet bar... Oh don't lean on it will fall off. Lighting: half are burnt out. The kicker-- when you check in the sish s are dirty for you. Management says: the owner thinks it's fine... I will have a nice scar from this unit, great vacation! Clean unit in GREAT location, and close to the jacuzzi. The unit is quite old in nature, but kept clean. They could improve by upgrading the heating system (space heater in one of the bedrooms went out with a blown fuse). Thanks for your feedback. Chamonix is a great location. We're pleased to hear the jacuzzi was great. I've notified our maintenance team of the blown fuse. I look forward to your next trip to Mammoth Lakes.